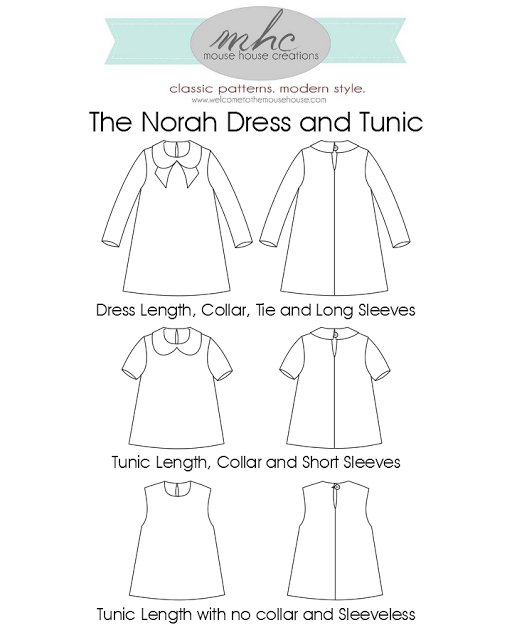 I am so excited to be a part of The Norah Dress by Mouse House Creations pattern tour. This is my second Norah (my first one is HERE), and I absolutely love the pattern. It's well done, only 12 pages to tape, it has unique details (just check out the collars! ), yet it's basic enough that it can be easily modified. It's also an easy and quick sew; no zippers or buttonholes involved. The idea for this Norah was presented to me by my one year-old. She was emptying the shelves in the fabric cupboard one afternoon (perhaps her mother forgot to close it) and dumped a box of upholstery remnants on the floor. I got the box at a garage sale last summer. A nice shade of green piece of fabric caught my eyes; I thought it would make a nice pair of shorts for Ania. It was really too small for anything else. Later that afternoon, my three year-old accidentally spilled a jar of buttons on the floor. 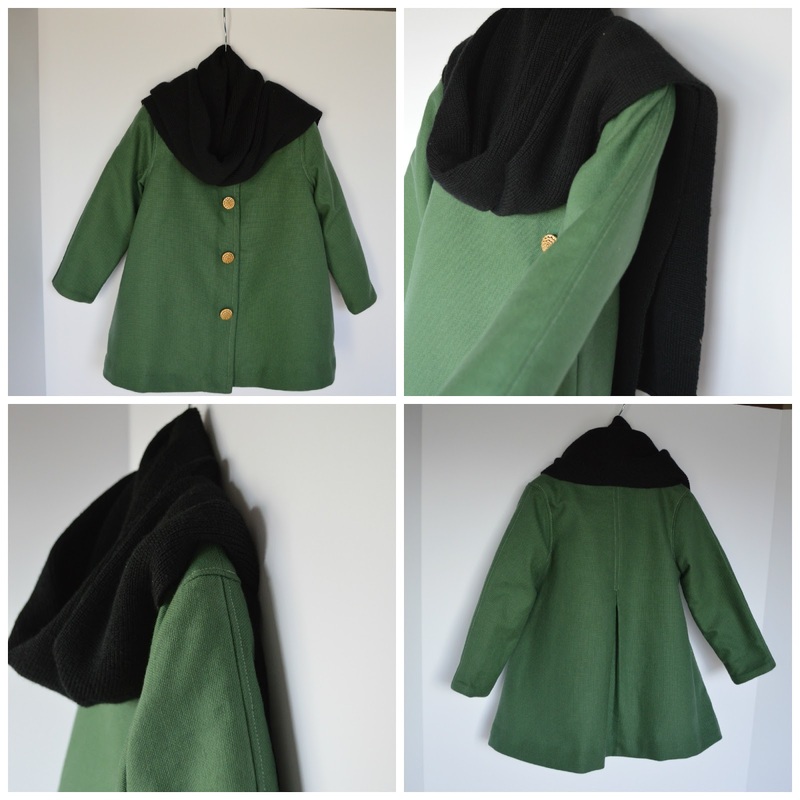 I thought the vintage golden buttons would be perfect with the green fabric for a pair of shorts... or a coat. 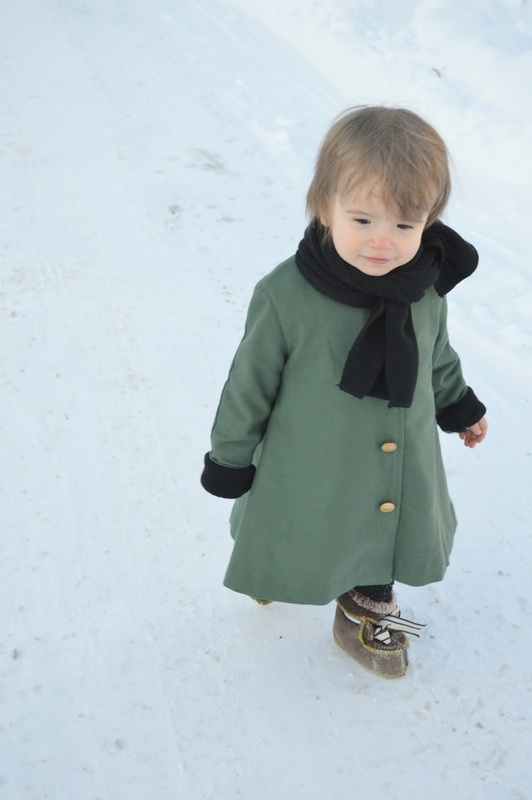 Yes, a coat for Evelyn and I could use the Norah pattern as my starting point. Serendipity. I only had a tiny piece of fabric, clearly not enough to make the coat, but such a small detail wasn't going to stop me. Instead of the collar, I attached the scarf to the coat. It came from a wool cardigan. I used the rest of the cardigan to line the coat. I quite like it; it's different and practical. I also added a pleat in the back. Everything was going as planned until it was time to make the buttonholes and my machine absolutely refused. I tried three times to no avail. Ugh. I attached snaps and added buttons on top. - Sewing Like Mad has an excellent tutorial on how to add a button placket to any pattern. 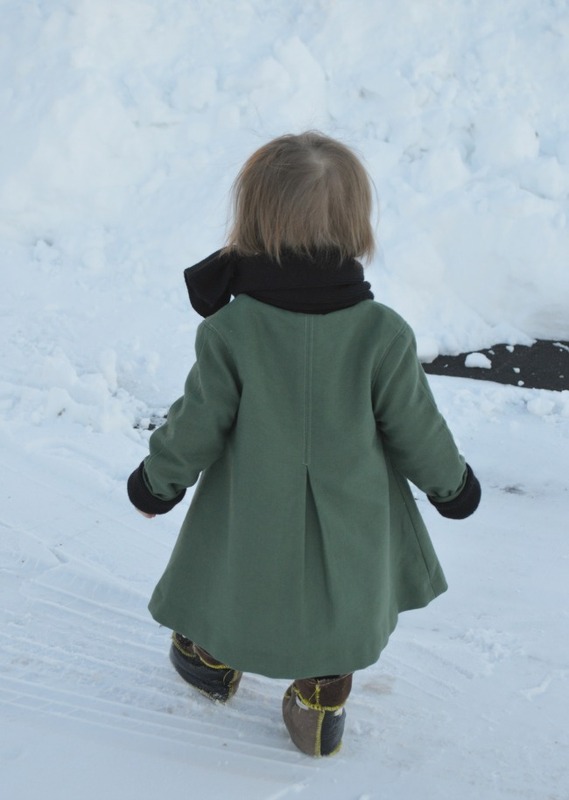 - Since the coat patterns are drafted a bit different with more ease added to the sleeves, the easiest way to do adapt a dress pattern is to size up. I made a 2T, instead of an 18 months. I left the sleeves longer, hoping that she will be able to wear it longer. - If you decide to line a coat with a stretchy material, cut your pattern pieces with considerably smaller seam allowances. And off she goes. It was -1F (-18C) when we took the pictures, so it had to be brief. This was my second attempt at the photo shoot. The first time I was so busy chasing her around, that I forgot to adjust the settings on my camera and the pictures were too overexposed. Head over to the Mouse House to check out everybody's awesome creations and buy the pattern! Amazing Olga!!! Seriously, I knew you gave me a hint that you made something different, but this is just awesome! It looks SO well made and your cute pie looks super cozy. Thanks so much for being a part of my tour! Olga, your coat is brilliant! Great job Olga! Love that you use a cardigan for the lining. incredible olga-- I love it! I love this soooo much. 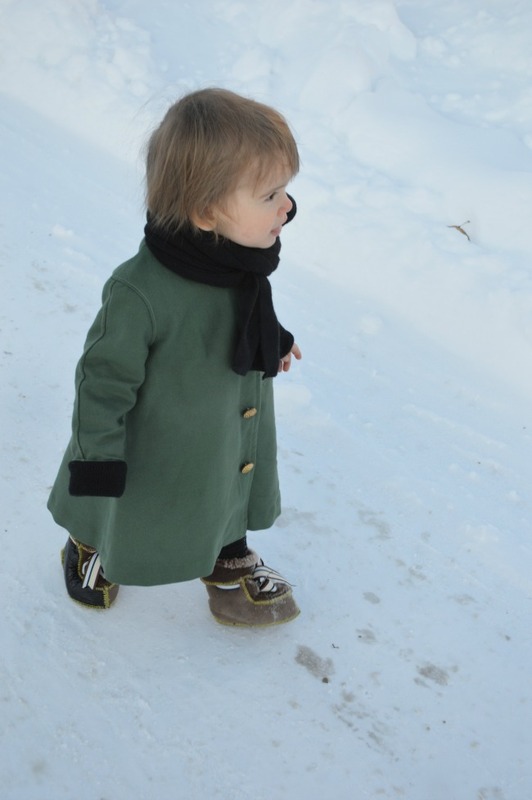 My Norah ended up with a button placket down the back and it made me wonder how it would look as a coat/jacket. You nailed it! Super!i especially love the color, beautiful. Very creative, Olga!! I shiver just thinking of your frigid conditions for these photos!! This is just fantastic. I think the outfit is brilliant on different levels! How come such scarce resources brought the best of your creativity to life :)? I think it is one of my favorite creations so far 1) I LOVE the deep green color (as they call it on my favourite fashion show the “color of precious stones :)” 2) the round scarf turned into a collar, so fashionable and unique! 3) the two outfits made from the same pattern, are so different, I would never have guessed that the base is the same and 4) the snow effect, of course (I can understand why you couldn’t stop). The pictures just look like an illustration to a fairy tale, around 1850... and Evelyna is so sweet and small. LOVE! Olga, that is fabulous - practical & adorable! My daughter just gave me two sweaters & I'm thinking that one of them would be great used with this adaptation. that's great, Olga, I really love how it cames out!!! And the snow effect is amazing! How did you do? Wow! I'm so impressed with this. I love how your daughter "helped" you pick out the fabric and buttons. :) I hope I can make a coat someday! It's just beautiful and I love all the details that you mentioned-the topstitch in the back. Great job, Olga! Pinning and sharing! Its such a sweet little photo shoot. What an adorable little child you have! I really love how that back seam turns into a pleat on your design. Yep, love the snow effect! And I just love this coat. The scarf for the collar is genius! 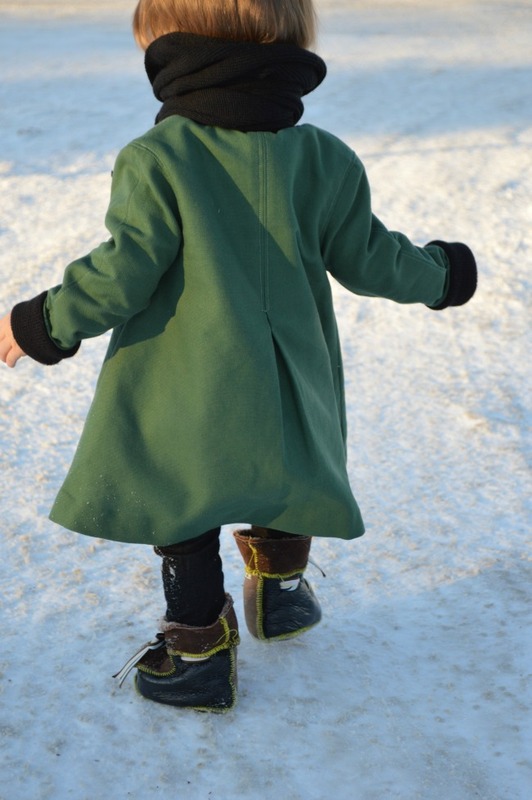 So glad you saved those scraps and leftovers- they're beautiful, the coat is beautiful, Evelyn is beautiful, and your post is beautiful! BEAUTIFUL!!! It's adorable! The pattern is so cute, but I love the alterations you made! It's such a beautiful coat! I LOVE your coat, Olga!!! Fantastic job making it using a dress pattern... very impressive. This is such an amazing pattern re-fashion! It works so well as a coat. I love your incidental top-stitching details - really adds to the overall aesthetic. Re: button holes - I am yet to have a machine that will co-operate and make me a perfect, stress free button hole! Snaps are a great back up plan.